Student group (3-4 persons) remediation studies are an effective way to apply learned hydrogeology concepts to real world problems. 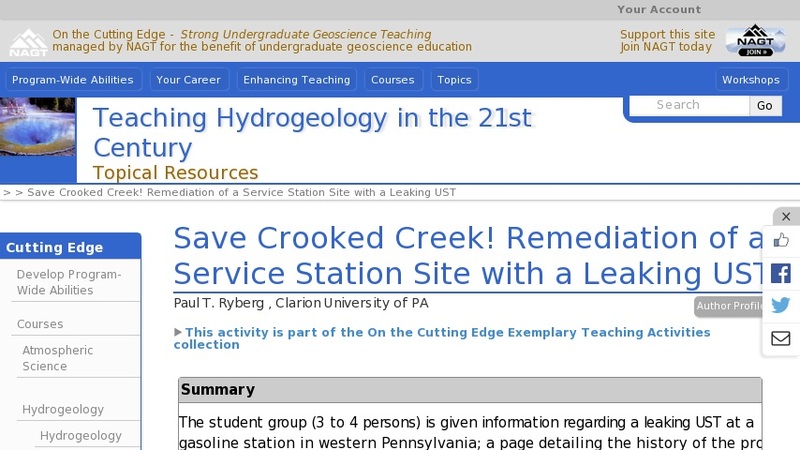 The Crooked Creek gas station with leaking underground storage tanks is just one of 4 to 5 projects which students can work on as a final project (2 to 3 weeks) in a hydrogeology course. The student group (3 to 4 persons) is given information regarding a leaking UST at a gasoline station in western Pennsylvania; a page detailing the history of the problem and a small sketch map if the site. They must then (over a 3 week period) research the geology/hydrogeology of the site, produce maps and cross-sections, and complete a detailed report, budget and timetable which summarize their remediation plans. Group members also give a 20 to 30 minute summary presentation to the rest of the class.